#032 Are We Alone In The Universe? | That's In The Bible? 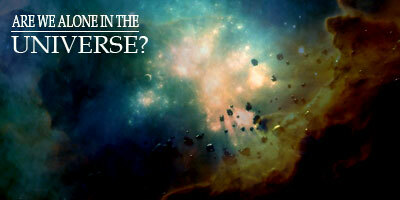 #032 Are We Alone In The Universe? Anyone that has gazed up into the heavens on a star filled night has wondered if we are alone in the universe. Join us as we look to the Bible to find out if ET is out there somewhere. LISTEN #032 – Are We Alone In The Universe? 1. Introduction: This question has been on the minds of men for hundreds of years. With the invention of the telescope in 1608, and the invention of the radio telescope in 1931 we were able to get our eyes and ears into the deep parts of space. The bigger and bigger the universe becomes to us, the more speculation arises. Many say with all the trillions of stars and planets, how can we truly be the only life forms out there? The interest in UFO’s and little green men became even more popular on June 24, 1947 when Kenneth Arnold was flying his single-engine plane over the cascade mountains in Western Washington State and saw nine objects flying in single file at an estimated speed of 1600 miles per hour which at that time was three times faster than any known aircraft available. Arnold later stated that these unidentified flying objects “flew like a saucer would if you skipped it accross the water.” This is where the “flying saucers” began to become a popular subject. Then only eight days later on July 2, 1947 the most famous UFO incident occured in Roswell, New Mexico as a supposed crashed saucer with alien bodies was recovered by the United States Military. From then on Hollywood took hold knowing they had a vast audience and started mass producing films depicting aliens from outer space invading earth. So from that time on it has just been believed that these UFO’s and beings must be from outer space. But what does the Bible say about other life forms other than on earth? 2. God Limits Himself: God tells us in [Revelation 19:6] that He is omnipotent, that He is all-powerful and can do anything. So many people bring up the point that for us to say there are no life forms on other planets would be limiting God and putting Him in a box. But to say that God does not limit Himself would be a lie, because God does limit Himself. God puts Himself in a box sort of speak and that box is the Bible, the word of God. God can do anything as long as it does not conflict with His written word. For example since God can do anything then He can lie right? That’s not right, God cannot lie according to [Titus 1:2]. Since God can do anything then He can change correct? Not correct, according to [Malachi 3:6] God does not change because it is recorded in the word of God. So as you can see no one puts God in a box, God puts Himself in a box, the word of God. God’s word will never change [Psalm 119:89] “For ever, O Lord, thy word is settle in heaven.” God has limited Himself to His unchanging word, and will never step outside of it. 3. What is God’s Pattern? Is it in God’s character to populate other planets or would He just pick one planet to populate? The Bible shows us that God has a pattern in the way He does things, lets see what this pattern is: When God created mankind, He did not create groups and pockets of men and women all over the world, but He created only Adam and Eve in one place on earth which is Eden, the whole human race came from one man and that is Adam [Genesis 1:26-28]. When God destroyed the earth with a global flood, only one man was saved with his family and that is Noah. God kills all others that are on this earth that did not believe God who told them there would be a global flood. There was only one way to be saved from this flood, and that was the ark, the one and only place of safety [Genesis 6:17-18]. When God wants to create a great nation for Himself he chooses only one man to do it, with the exclusion of thousands of other people [Genesis 12:1-3]. When God calls out a people, only one nation of people is selected, the Nation of Israel. God did not choose any of the other nations, only one, the Jews. God chose only one piece of land for Himself and His chosen people and that is Israel. He could have chosen to place His people all over the world, on different continents if He wanted to but He only chose one little piece of land which is Israel [Genesis 15:18]. God also has provided only one way to get to Heaven and that is the Lord Jesus Christ. Jesus says in [John 14:6] “I am the way the truth and the life, no man commeth unto the father but by me.” Also in [1st Timothy 2:5] the Bible said; “For there is one God, and one mediator between God and men, the man Christ Jesus.” There is only one way and one mediator, and that is the Lord Jesus Christ. God ignores all the other prophets, and religious teachings and tells us that there is only one way of salvation, all the other religions lead to an eternity in hell if you do not have the one and only Saviour the Lord Jesus Christ. These few examples out of the Bible show us clearly that God discriminates and chooses only one over thousands and even millions of other possible candidates. This is God’s pattern that is layed out in the Bible, and with this pattern we can now apply this to the subject to help answer our question. 4. God Favors planet Earth over all other stars and planets. First we see that Earth was the first planet created by God [Genesis 1:1] says;”In the beginning God created the heaven and the earth.” God made the earth before He created the sun and moon or any of the stars [Genesis 1:16]. God’s dealings have always taken place here on earth or in Heaven. Second we see that according to the Bible, Earth is the only planet that God named. God never named any of the other planets, man has named all the other planets after false gods. Thirdly we see that Earth was created by God to be inhabited by man. God created it with a breathable atmosphere and just the right temperature so that man wouldnt freeze to death or die of too much heat. [Psalm 115:16] “The heaven, even the heavens, are the Lord’s: but the earth hath he given to the children of men.” The fourth point is that God didn’t create the other planets to be inhabited. The sun, moon, and all the stars in the universe were created by God soley for one purpose, and that purpose is not to be inhabited, but to give light on the earth, and for signs, seasons, days, and years [Genesis 1:14-18]. The last point is that the earth is destined to become the home of God’s Kingdom for all eternity [Daniel 2:44], [Revelation 21:1-3]. God, just like we saw his pattern has been, excludes all the other planets, and chooses Earth to be His dwelling place with men. 1. God Limits Himself to His written word. 2. God many times chooses only one in exclusion to the vast majority. 3. God Chose Earth over all the other stars and planets. This entry was posted on April 17, 2010 at 8:27 pm and is filed under That's In The Bible - Podcast. You can follow any responses to this entry through the RSS 2.0 feed. You can leave a response, or trackback from your own site. You are so right in saying that the inhabitants of space are dark, and the second heaven does not have good angels. And well, I’m going to bet that when those locust/ grasshopper creatures come in revelation 9 and Isaiah 40, people will think that it’s just “aliens”. Satan and his fallen angels are simply going to be accepted by people as aliens from outer space in the end times. Revelation 9:7 And the shapes of the locusts were like unto horses prepared unto battle; and on their heads were as it were crowns like gold, and their faces were as the faces of men.8 And they had hair as the hair of women, and their teeth were as the teeth of lions. 9 And they had breastplates, as it were breastplates of iron; and the sound of their wings was as the sound of chariots of many horses running to battle. 10 And they had tails like unto scorpions, and there were stings in their tails: and their power was to hurt men five months. 11 And they had a king over them, which is the angel of the bottomless pit, whose name in the Hebrew tongue is Abaddon, but in the Greek tongue hath his name Apollyon. It is he that sitteth upon the circle of the earth, and the inhabitants thereof are as grasshoppers that stretchith out the heavens as a curtain and spredith them out as a tent to dwell in. 23 That bringeth the princes to nothing; he maketh the judges of the earth as vanity.24 Yea, they shall not be planted; yea, they shall not be sown: yea, their stock shall not take root in the earth: and he shall also blow upon them, and they shall wither, and the whirlwind shall take them away as stubble. Arianna, I agree with you, those locusts are part human part animal, and when those that are left on this earth are tormented by them they most likely Will not believe the Bible account but believe they are aliens. But also this whole increase of interest in aliens and ufo’s could be orchestrated by the Devil himself and his fallen angels. I have often wondered about how the world will explain the disappearance of the Christians at the rapture. Could it be that once the blood bought multitude is raptured out of here that the fallen angels will show up saying they are aliens from outer space and have taken all those Christians out of here because they were the ones causing all the problems down here on earth. All you hear these days is about how we have to be tolerant of everyones religious beliefs and that we can’t tell anyone that they are going to hell because their religion doesn’t line up with the biblical plan of salvation. But if you are a true Bible believer you can’t help but tell them that they are wrong according to God’s word. Now with all the Christians out of the picture they can set up their one world religion with the Antichrist pretending to be God himself. All because the “aliens” (fallen angels). This could be the reason for all the UFO sightings, who knows, all I know is that I praise God everyday that I’m saved by the blood of Jesus Christ and will be raptured out of here before the tribulation begins! You had mentioned that if we knew of other AB1611 bible teachers online to let you know. There truely is a dearth in the land and as far as I can tell you are the only ones TEACHING on i-tunes. http://www.kjv1611.org/downloads.html is a wonderful weekly teaching broadcast. Also at http://www.jamesknox.com/ is some great teaching along with preaching. Both not available however on itunes. And if you are into picking thru http://www.voicesforchrist.org for some old brethen stuff.